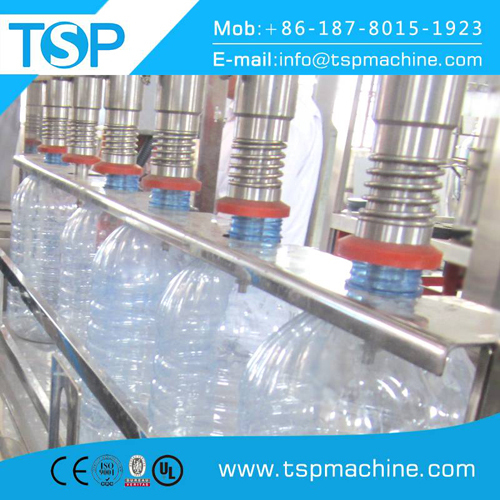 The series of automatic production line equipment for pure water (PET,PE,PP,HDPE) polyester bottles of various mineral water, purified water, alcohol and other non-carbonated beverage production and achieve rinsing jug, filling and capping in one machine, reducing the material contact time with the outside world, improve the sanitary conditions, production capacity and economic benefits. Hanging jug handing structure, replacing the jug more convenient, faster and easier, host using advanced PLC automatic control technology, the key electrical components are used in Japan's Mitsubishi, France Schneider, OMRON products. This model is mainly for 3L-10L bulk bottled and jug water filling. On the basis of a small bottled water on triple made improvements as cleaning, filling and sealing for one, is not used for a large jug of conventional vertical-type filling methods, increased automation, reduced footprint, reduced number of operators, reduce labor costs. In order to ensure a large jug run triple in the rotary filling machine in a smooth, red jug clips, filling valve and pressure hijab are special custom, and taking into account the big jug bulky, heavy weight after filling, increase the filling end of care the other has a nylon jug care system to ensure the stable operation of the entire machine.